The information I'm about to present here is frightening. There's really no way around that. However, I request that you do your very best to maintain a calm state of mind. You'll notice if you read virtually any mainstream article on the topic that they make a point of insisting that Ebola is only transferred by physical contact with bodily fluids. This is not true, at all. UPDATE: Someone pointed out that in medical terms, if the virus is transferred through tiny droplets in the air this would technically not be called an “airborne virus”. Airborne, in medical terms would mean that the virus has the ability to stay alive without a liquid carrier. On one hand this is a question of semantics, and the point is well taken, but keep in mind that the study did not officially determine how the virus traveled through the air, it merely established that it does travel through the air. Doctor Kobinger's hypothesis regarding droplets of liquid is just that, a hypothesis. For the average person however what needs to be understood is very simple: if you are in a room with someone infected with Ebola, you are not safe, even if you never touch them or their bodily fluids, and this is not what you are being told by the mainstream media. Essentially I am using the word “airborne” as a layman term. Now I'm not going to speculate as to whether these so called “journalist” and public health agencies who keep repeating the official line regarding the means of transmission are lying, or are just participating in some massive display of synchronized incompetence, but what I will say, is that this shoddy reporting is most likely getting people killed right now, and may in fact put all of humanity in danger. By convincing people that the virus cannot travel through air, important precautions that could reduce the spread of the virus are not being taken. For example the other passengers on the plane that traveled to Lagos, Nigeria were not quarantined. [UPDATE August 6th]: According to the AP and the BBC, Patrick Sawyer, the Ebola infected man who traveled to Lagos Nigeria by plane, passed the disease on to eight health workers before being properly isolated. Nigerian health authorities acknowledged Tuesday that they did not immediately quarantine a sick airline passenger who later died of Ebola, announcing that eight health workers who had direct contact with him were now in isolation with symptoms of the disease. In spite of the seriousness of this disease, and in spite of the fact the fact that the BBC itself covered a study in 2012 that demonstrated that Ebola can spread through the air, no one in the corporate media has budged from the official line regarding transmission. Experts say people infected with Ebola can spread the disease only through their bodily fluids and after they show symptoms. Ebola spreads through contact with organs and bodily fluids such as blood, saliva, urine and other secretions of infected people. The virus spreads by contact with infected blood and bodily fluids – and touching the body of someone who has died of Ebola is particularly dangerous. Casual contact is defined as a) being within approximately 3 feet or within the room or care area for a prolonged period of time while not wearing recommended personal protective equipment or having direct brief contact (e.g., shaking hands) with an EVD case while not wearing recommended personal protective equipment. The implication of this statement is very, very clear: Ebola DOES in fact travel through the air. This is critical information and it should be highlighted in large letters on every page, but instead it is tucked away in fine print where many won't look. 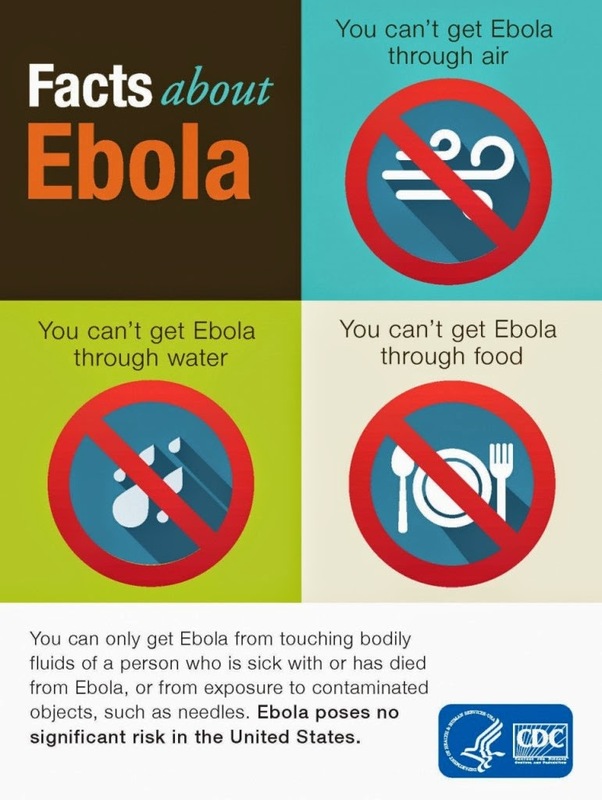 Given the fact that the CDC previously was running infographic campaigns claiming that Ebola does not travel through the air (see image below) this is highly irresponsible on their part. Hat tip to the Pontiac Tribune for making us aware of this information in their article on the topic. Note we saved a cached version of the CDC page just in case they decide to alter the text in the future. Furthermore, if the official vectors of transmission are accurate, please have them explain how 170 of their aid workers have been infected in spite of being covered from head to foot with protective gear? This particular strain of Ebola is not Ebola Zaire. This is a new strain, and it may in fact be more dangerous than the Zaire variety. Not because of any difference in the symptoms (the symptoms are identical), but because this new virus seems to be harder to contain. Whether this is due to some characteristic of the virus itself or merely dumb luck is uncertain at this time, but the rate at which this outbreak has extended its range is unprecedented. According to the CDC this virus is genetically 97% similar to the Zaire strain. However if you are interested in this virus’ phylogenetic relationship (genetic lineage) to the Zaire strain you should look read “Phylogenetic Analysis of Guinea 2014 EBOV Ebolavirus Outbreak” on plos.org. The three sequences, each 18,959 nucleotides in length, were identical with the exception of a few polymorphisms at positions 2124 (G→A, synonymous), 2185 (A→G, NP552 glycine→glutamic acid), 2931 (A→G, synonymous), 4340 (C→T, synonymous), 6909 (A→T, sGP291 arginine→tryptophan), and 9923 (T→C, synonymous). Note that there doesn't yet seem to be a consensus as to what this new strain is called. One study referred to it as “Guinean EBOV”, another as “Guinea 2014 EBOV Ebolavirus” and others are still referring to it as Zaire. Given that we can specifically name the points where the virus has mutated, using the old name is misleading. Right now the question on everyone's minds is whether this virus will spread outside of Africa. Considering the fact that Ebola has a three week incubation period, can travel through the air, and has already hitchhiked onto an international flight, this is a very real possibility. There are some that are downplaying the probability of this outcome, and to be honest, I hope that they are right, but the simple fact of the matter is that these people are basing their assessment on the faulty premise that Ebola is not an airborne virus. Now the first thing you might be feeling when looking at this situation is a sense of fear and helplessness, and while that's a perfectly normal reaction it's really not helpful. Instead we should be thinking in terms of practical steps we can take to influence the outcome. 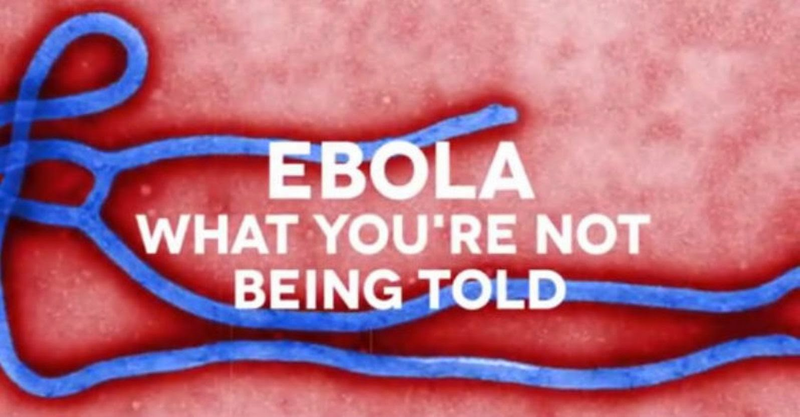 One thing we can all do is to start confronting journalists and public officials who keep making false statements regarding the way Ebola spreads. Use the links to the original study, the BBC report from 2012 and this video to put them in their place. We also need to confront the fact that there isn't a full out, coordinated, international effort to contain this. This is being treated like a sideshow but it has the very real potential to become a main event. The doctors on the ground in West Africa don’t have enough staff or resources to deal with this situation. It is absolutely inexcusable for the U.S. and the E.U. to be investing billions of tax payer dollars into their little power games in Ukraine and Syria (which are both in the process of escalating right now by the way) while Ebola is getting a foothold in Africa. Every available resource should be shifted to West Africa in order to contain and extinguish this epidemic right now. This is serious. Call them, write them, heckle them in the streets if you have to, but don't allow them to ignore this issue. Make it impossible for them to pretend later that they didn't know. Now whether or not official policy towards the Ebola crisis changes there are some precautions that you should take right now for yourself and your family. 1. Know where you would go if you needed to leave your home on short notice. If Ebola escapes Africa the last place you want to be is in a densely populated metropolitan area. It may be that the most practical destination for your family would be a rural area near your current home, but if you already have concerns about the government you are living under, and how they may handle a crisis like this, then you might want to start looking at alternatives. Finding an alternative location that suits your family's needs is something that requires a lot of time and research, so don't put this off. The primary characteristics you should be examining in an alternative destination are geography , political environment, climate, population density and visa terms and requirements. Ideally you would want to end up somewhere that is geographically isolated to some degree. 2. If you don't have passports for yourself and each of your dependents, get them now. This is not to say that you should leave your country, but you should have the means to do so. In countries where the Ebola outbreak is underway it is getting harder and harder to exit. Borders are being closed down. Flights are being cut off. This didn't happen right away, but you definitely don’t want to be waiting for your passport to show up if Ebola arrives in your city. 3. Know what you would carry with you if you had to leave on short notice. Have those items ready, and have the luggage to carry them. It would be wise to consider buying a pack of surgical masks as part of this. Now if you think about it, these preparations are wise steps to take regardless of whether the Ebola situation deteriorates or not. Knowing where you would go in an emergency, and having the means to get there on short notice is important for a wide variety of situations. The civilian population of Iraq, Syria, east Ukraine, and Gaza can attest to that. Whatever you do don't let fear take control of your mind. Take the steps you can take now, monitor the situation calmly, and be prepared to adapt if necessary. [UPDATE July 31st]: A number of people have requested that I comment on the fact that the Americans infected by Ebola are right now being flown into the U.S. My personal opinion is that this particular move will not lead to the virus getting out. This event is going to be highly scrutinized, and the isolation security should be at max. The real danger isn't in these highly controlled transfers and quarantines, but rather in the ongoing flow of air travel from these regions. Thirty five countries are merely one flight away from an Ebola zone right now. Why is this random air travel more dangerous? Because if it gets in when people aren't looking, it can spread before containment measures are put into place. [Update September 30th] The U.S. just had its first confirmed case of Ebola in Dallas today. You should definitely keep an eye on the situation. Ebola is spreading exponentially at this point in west Africa. The number of cases are doubling every three weeks. As the number of infected increases in the hot zone the odds of new cases arriving in the U.S. or Europe increase as well. P.S. If you want to learn more about Ebola I highly recommend that you read “The Hot Zone” by Richard Preston.